This week, Tyrone Bell answers the age-old question: free weights or machines? 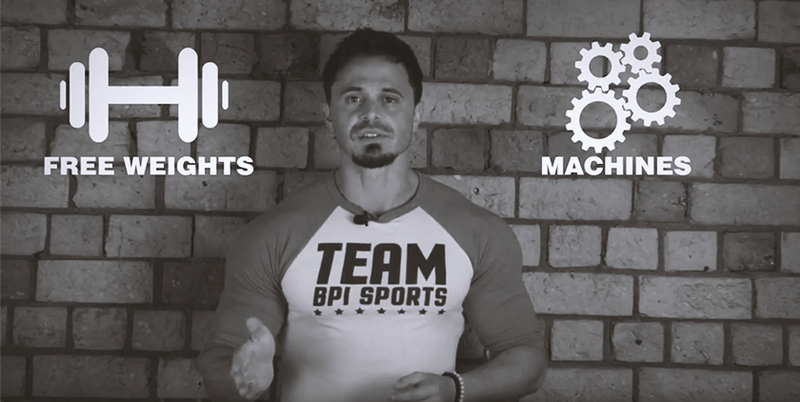 “Today we’re looking at one of the biggest debates in resistance training: free weights vs. machines. Which is better for muscle growth? Now, in any given gym, you’re going to find two groups supporting one or the other. So first, let’s hear them out and see where each is coming from. Free weights are functional. Machines are not. Machines don’t strengthen your surrounding stabilizer muscles. Free weights increase strength better. Free weights cause more muscle damage, therefore causing more muscle growth. Machines provide more constant tension throughout the movement range. Machines are better at targeting specific muscle groups. It’s easier to compensate with free weights and lose the load off the targeted muscle. Machines are less demanding on the central nervous system, therefore supporting recovery and as a result, efficient muscle growth. It’s safer to go to failure while using machines. Both groups have some decent points, but the way we’re going to determine who wins this debate is with a stack up. We’ll stack each group up against some commonly known and accepted protein synthesis muscle growth triggers and find out who does it best. Muscle fatigue refers to performing a set of repetitions to the point of complete muscular failure. Understand that with each rep of a particular exercise that you perform, you’re fatiguing more and more muscle fibers. As they fatigue, your body is forced to recruit more muscle fibers so it can continue to perform the required contractions over the continuing repetitions. Once you’ve reached complete failure on the set, you ought to be trying to activate as many muscle fibers as your body can effectively tap into to generate the required force, in turn, stimulating those successfully recruited fatigued fibers to grow. So, which technique produces muscle fatigue more effectively? Free weights? Or machines? The winner of the first comparison is machines. Why? Two reasons. Going to failure greatly increases the neurological demand of an exercise. As such, going to failure on exercises with a lower neurological demand is less taxing on your central nervous system. Both isolation and compound exercises on machines are the best options when going to complete failure and reaching complete fatigue. With machines, you’ll achieve this muscle fatigue trigger without overtaxing your central nervous system. Now, I’m not saying fatigue shouldn’t be reached on free weights. I personally do it regularly and have many of my online clients doing the same. But when you take central nervous system stress into consideration, machines win. The second reason for this is that there’s less potential for load transfer on machines. The more fatigued you become in a set, the more you tend to compensate with muscles other than the ones you’re targeting. It’s easier for the load percentage to start transferring over onto other muscle groups to help support and perform the lift. This isn’t what we’re after if targeted muscle growth is our goal. You probably already know that when muscle fibers undergo high levels of mechanical tension and are stretched while they’re producing force under load, microtrauma can occur in the muscle fibers themselves. This sparks muscle growth. What greatly contributes to this is how in sync your targeted muscle fibers contract and relax. The better they work together, the more power is generated. When they work in unison, it’s great from a performance point of view, but not so much from a muscle-building point of view. The thing is, the more unbalanced the load is displaced over the involved muscle fibers, the more actual muscle trauma occurs. When the load you’re lifting is unevenly displaced across involved muscle fibers, some of those fibers will experience greater load tension, ultimately inducing more damage. When you perform a brand-new exercise or an exercise you haven’t done in a while, your muscle fiber coordination is poor. Therefore, the load isn’t displaced equally. This leads to more muscle damage. So, who takes the throne for this hypertrophy factor? Free weights. What makes free weights superior is the fact that free weight lifts will never be as controlled as machines. No matter how experienced you are, muscle fiber coordination requirements are always more demanding with free weights. That’s simply because the plane of movement isn’t locked. With machines, your fiber efficiency is greater, therefore reducing how much damage the exercise generates on the fibers themselves. The presence of lactic acid itself is a mechanism for muscle growth. You know what I’m talking about – that burn produced by accumulating lactic acid that we all know and love (or hate)! It does a lot more than give you the feeling that you’re actually working. The accumulation of lactic acid itself increases STEM activity, contributes to muscle cell swelling and decreases myostatin, helping lead to muscle growth. All these factors support anabolic responses, stimulating new lean muscle development. This occurs with a build up of lactic acid in the targeted trained muscle and by restricting it from exiting as much as possible during the session. Who takes this round? Machines. There’s a couple of different methods to achieve this lactic pooling. The most common are the manipulation of tension duration and the use of shorter rest times between sets. Now, you can have short rest times with either machines or free weights, so that in itself isn’t a factor. But it’s the manipulation and use of tension across long periods of time under constant load, keeping the targeted muscle constantly engaged that’s the differentiating factor here. Long periods of tension that allow lactic acid to pool up can be achieved with either free weights or machines, but it’s the result of the accumulating fatigue and the lactic acid’s affect on your muscle fibers’ contractions that will kick in and likely cause a breakdown in form. Which would you rather have: a breakdown in form under a heavy barbell squat? Or a breakdown in form on a horizontal, pin-loaded leg press? Purely from a safety point of view, machines take this one. So far, the score is 2-1 in favor of machines. Do we have an undisputed winner? Are machines superior? No. Truthfully, the only winner here is the guy using both machines and free weights. There really is no right or wrong. It’s all about selecting the best methods for the specific hypertrophy trigger that you want to tap into at that particular stage and focus in your program. For instance, when the focus is on producing large volumes of muscle trauma as the primary trigger for growth, then the biggest percentage of your program’s exercises should be free weights. Likewise, if you’re at a phase in your program where metabolic stress is the primary mechanism, then the use of machines should take precedence.